In recent years, there have been several high-profile cases of elderly men and women who have collapsed or suffered accidents in public spaces who then sue the good Samaritans who have tried to help them. These cases have created a genuine and widespread fear that helping a person in need will lead to personal financial loss. This is the top story on Sina Weibo today, and it's FUCKED UP to the nth degree. On Thursday afternoon in Foshan, Guangdong province, a two-year-old toddler was run over by a van outside a hardware market. The first passerby, who is very likely to have witnessed what happened, walked around the girl, without even looking down to see what happened to her. Behind him was another man, who apparently also witnessed the accident, but decided to make a u-turn so he wouldn't have to come up close to the girl lying on the road. One cyclist took a brief look at the girl, but decided to cycle away as if nothing happened, and a fourth passerby also walked around the toddler. Sadly, that's not all. Read the story here for more details. However, a video on Youku that is now making the rounds in China may be more than enough. Warning: the video is "graphic" and could be very upsetting to some. It includes video of the little girl being run over more than once, numerous people passing by without helping, the reactions of the parents upon seeing the video, etc. It's in Chinese but if you skip to the 1 minute mark what you see doesn't require translation. I must say the video left me stunned [Update: The girl has passed away; Update 2: Earlier reports were incorrect and the girl's condition has stabilized; Update 3: After one week in intensive care the girl has passed away.] It is positive, though, that the story is being reported and passed around in China on sites such as Sina Weibo. When I asked someone from Shanghai about it she wrote, "I really dont know what to say... an abnormal society leads to this. When I learned about it I felt guilty to be a Chinese in this abnormal society." I asked someone from Hong Kong whether she thought this could happen there. She carefully said, "Not now." She then explained that she regularly sees news of people not helping accident victims in mainland China and that she worried things in Hong Kong might change as more mainland Chinese visit or move to there. What seems particularly telling is that neither of the two people were surprised that something like this could occur in mainland China. Park Street, where Torres was hit, is part of a notorious high-crime area, with many residents unwilling to help police or be labeled a "snitch" by others. People in the neighborhood struggled to explain why no one helped a seriously injured elderly man. "This area here is hot, a lot of bad stuff," one man who declined to give his name told ABC News. "I gotta go now." When asked why people wouldn't call for help, he said, "If you want to, but you're involved then." Like in mainland China, the fear of putting oneself into a negative situation may have been a key reason for why a number of people didn't help an accident victim. Not only does this put some people's behavior in a new light, but it suggests that the behavior could be better influenced if the sources for the fear were to be addressed. Unfortunately, in both Hartford and Foshan the sources may be part of societal issues that are not easily changed. Regardless, after watching the video of the little girl in Foshan maybe more people in China and elsewhere will be willing to try. To end on a more uplifting note I'll mention that just a few days ago a stranger saved a woman from an attempted suicide in Hangzhou, Zhejiang province. In light of the stories about people not helping accident victims in China, it is hard not to notice the identity of the rescuer. It is emphasized in the content and title of an article by Xu Wenwen on the Shanghai Daily: "Praise for foreigner's lake rescue bravery". Afterwards, she didn't leave her name or contact information, Hangzhou police said. Update: Follow-up on this post here: "More on People Not Helping Accident Victims in China"
always scary to hear, not matter the society. Maybe it is that good deeds are less newsworthy...or a dark way to put it is that as long as terrible cases such as this is deemed newsworthy it is a "positive sign" for the society as a whole that such acts are still considered deviant? As an American I am appalled at any person observing an accident and not stepping in to help. The incident you noted more than likely happened in a gang area where everyone shuts up and do not give police, yet the person who said that even making a 911 (emergency call) makes you 'involved' has to be highly uneducated. That is an untrue, stupid remark. The article in Yahoo concerning the little girl made a statement about Chinese being afraid of being sued for helping another, "because his intervention broke government rules on dealing with accident victims." Is that true. Another person cannot help with accident victims and what does that entail? I am curious. 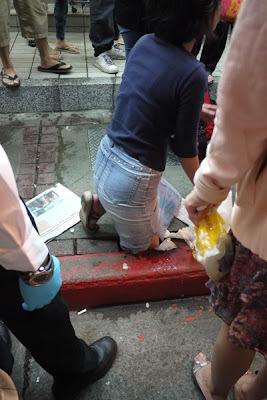 Oh, response to The Reluctant Expat: No it's not the rule, however in the case of the little Foshan girl, according the the 'Rules" she should have been left there until the police arrived. BUT, no one in China follows rules about many things, and this was an atrocious lack of human decency and kindness. People should have helped. Thanks for the comments all. Still pondering some of them but I've shared them in my follow up post here: More on People Not Helping Accident Victims in China. I remember in Flushing, New York City, there was also a similar case where a Chinese girl was killed an raped at night by a Mexican immigrant. There were several passers-by but no one even stopped to care or called the police. They take it as a regular thing, where people who are unlucky would just get killed and they themselves should stay out of it as long as they could. I feel in general that the more severe the accident/case is, the less likely people would want to help. 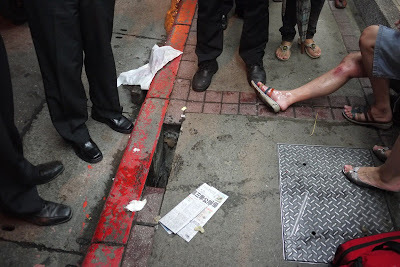 With small accidents like leg falling into the brick gap, people know that they won't be in any trouble if they helped. But with murders or car accidents, people worry about their own safety and would not consider coming up front. It's logical. It's also sad. Charlene, the incident in Flushing is certainly also very disturbing. I agree it's worth considering that people may have different levels of willingness to get involved depending on the type of accident. That being said, sometimes all that is needed is a phone call to emergency services (and sometimes it turns out calls were indeed made, it just isn't apparent on the video). Also, take a look at the video at then end of this post. Looks like people took a significant risk to save that man. Hard to look at that and not think something is wrong with China and the Chinese.